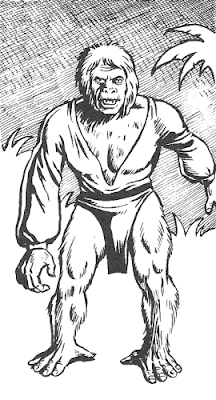 Part 8 of Lords of Creation features the Lands of Wonder – “six unusual settings where adventures may take place.” One of these settings, The Land of Ulro, “is a science fantasy world inspired by the mystical poetry of William Blake...” This is an interesting choice, but not inexplicable given that Philip José Farmer's “World of Tiers” series was specifically cited by Moldvay as an inspiration for Lords of Creation and Blake was an inspiration for Farmer's series. 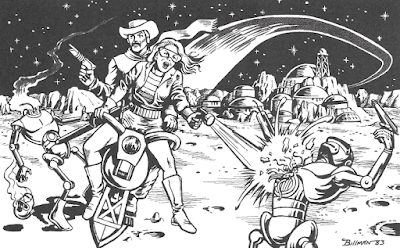 “Science fantasy” is one of the seven setting types Moldvay describes in Part 7 of the Rule Book. “Anything and everything goes in a science fantasy setting,” Moldvay informs us. Additionally, “science fantasy settings are the easiest to work with since anything mentioned in the rules can be used.” Science fantasy foes include (but are not limited to): GIANT ANIMALS, Le Comte de Saint-Germain, Kuan Yin, FELINES, SILKIES, and Väinämöinen. 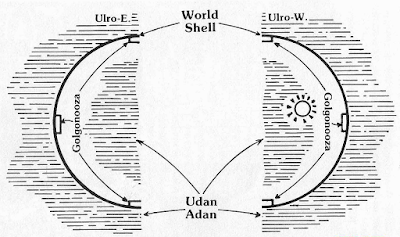 The physical form of Ulro is that of a huge hollow sphere. 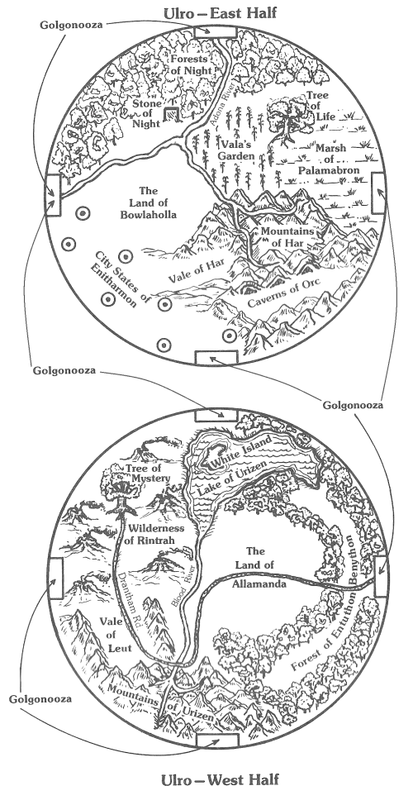 The inhabited area of Ulro is on the inside shell of the sphere. The sphere is filled with Udan Adan, that is, with outer space complete with stars and a sun which makes a daily journey through Udan Adan. 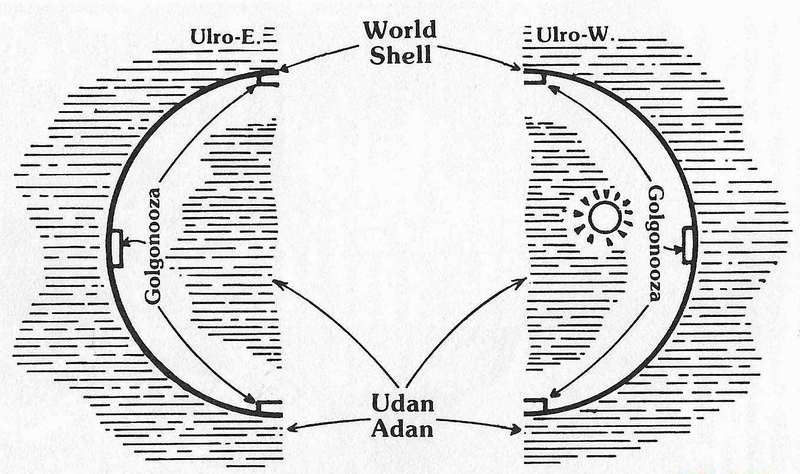 Paradoxically, Udan Adan really is outer space. By travelling into it one can travel to the outside of the sphere into normal space. Similarly, one can be travelling in normal space and find oneself in Udan Adan in Ulro without even noticing the transition. 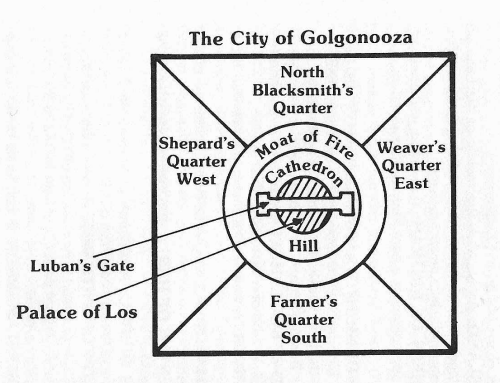 Golgonooza is a city of superscience and supermagic. 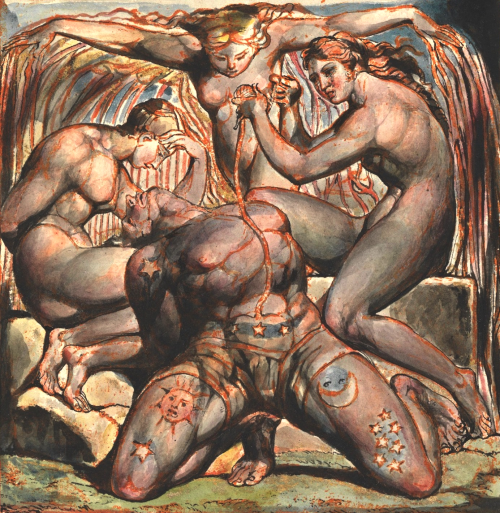 There are many individuals mentioned in the mystical poetry of William Blake. 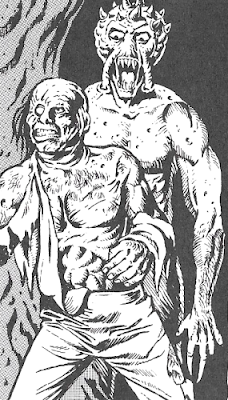 For reasons of limited space, only six were described in THE BOOK OF FOES under THE FAMILY OF LOS (Los, Enitharmon, Orc, Rintrah, Palamabron, and Vala). Other sons of Los and Enitharmon include: Theotormon, Bromion, Antamon, Sotha, Manathra-Vorcyon, Ozoth, Ohana, Har, Gon, Mydon, Ellayol, Ochim, Natho, and Harhath. The daughters of Los and Enitharmon include: Ocalythron, Elynittria, Oothon, Leutha, Elythiria, Enanto, Hevah, Thiralatha, and Ethinthus. According to the description of the Family of Los in The Book of Foes, they “do not call themselves 'gods and goddesses'...Their power has passed beyond such pettiness.” Each member of the Family of Los has every power of each class. (This necessarily includes 'cyborg'.) The least powerful member of the family detailed in The Book of Foes, Palamabron, “is the founder of abstract law and often appears in priestly robes, wearing a horned head piece.” Compared to Palamabron, Zeus and Odin are a couple of lightweights. Granted, Zeus and Odin both have every power class (including 'cyborg'), but Zeus is only worth 6,600 experience points and Odin, 4,350. Palamabron is worth a hefty 8,500 experience points. The word “game” implies that it is a complete game. However, the first page of the twelve page section has the subtitle, “Dueling Rules For Lords Of Creation™.” So, the “game” is a merely a supplement to the Lords of Creation combat rules. If the duelist is using two weapons (such as a dagger and rapier), the average of the two skills is used. Anyway, six maneuvers are selected, purchased, and written down in secret. Maneuvers can be performed in any order. Any given maneuver in the maneuver pool can be performed once (unless the duelist purchased the maneuver more than once). A duelist with two attacks per turn need only select five maneuvers in advance; a sixth maneuver can be purchased and performed on any segment. Similarly, a duelist with three attacks per turn need only select four maneuvers in advance. For a given segment, one duelist announces which attack maneuver he or she performs and the other duelist (if able) responds with an appropriate maneuver. The duelist with the higher initiative on the first turn has advantage and the option of being the attacker on the first segment. Depending on which maneuvers the duelists perform in a given segment, advantage can be transferred back-and-forth between the duelists. On the second and later turns, the duelist who has advantage on the first segment is determined by the maneuvers performed on the last segment of the previous turn. Initiative is rolled, but only to determine respective amounts of segment points. There are dozens of maneuvers and each is categorized as either an attack, a defense, a 'gaining the advantage', or a counter attack. Combat rolls are not made during a duel. An attack is automatically successful unless the defending duelist can perform a maneuver that works against that specific attack. A defense maneuver cancels an attack but does not transfer advantage. A 'gaining the advantage' maneuver cancels an attack and (appropriately) transfers advantage. A counter attack maneuver cancels an attack, transfers advantage, and launches an attack which the other duelist must attempt to cancel with his or her next maneuver. Each attack maneuver has an associated defense maneuver, a 'gaining the advantage' maneuver, and a counter attack maneuver. For example, against a 'thrust' attack, the defense maneuver is 'parry', the 'gaining the advantage' maneuver is 'circular parry', and the counter attack maneuver is 'riposte'. Also, a 'dodge' maneuver can be used as a defense against most attacks and an 'inquartata' maneuver can be used as 'gaining the advantage' against most attacks. A duelist targeted by a thrust is hit and suffers damage unless he or she performs a parry, circular parry, riposte, dodge, or inquartata. Not only are there dozens of maneuvers, but when any maneuver (except, presumably, dodge or inquartata) is purchased, a target (body) area must be selected for that maneuver. The nine target areas are: head, chest, abdomen, left arm, right arm, left leg, right leg, left foot, and right foot. So, against a 'thrust (left leg)' attack, possible response maneuvers are parry (left leg), circular parry (left leg), riposte (left leg), dodge, or inquartata. The maneuvers a duelist can perform are limited by the 'position' the duelist and his (or her) opponent occupy. 'Position' refers to the distance between characters in a duel. There are four positions. Position A is the closest two duelists can be (and still be in a duel). It is too close for swordplay; the only permitted attacks are punch, kick, and dagger thrust. Position D is the furthest two duelists can be. 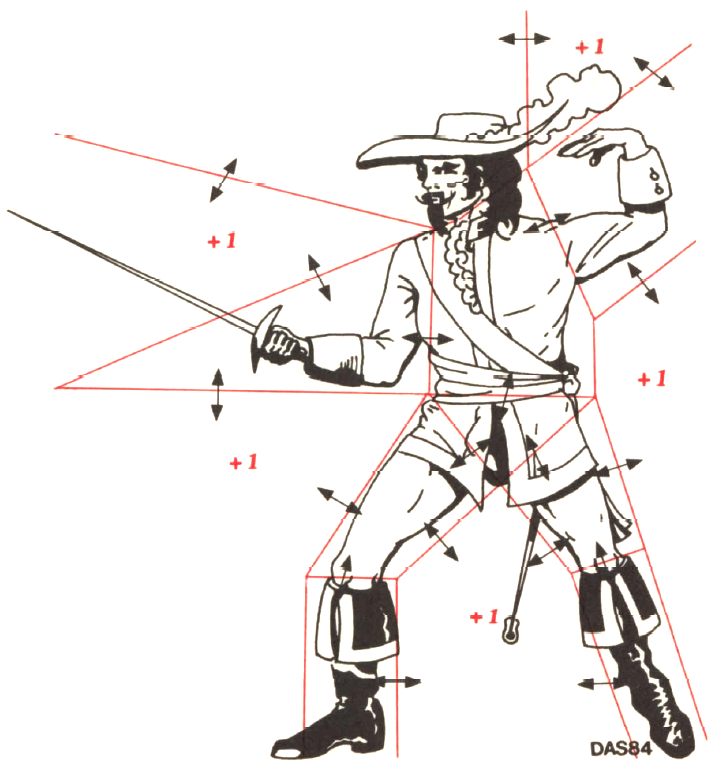 In this position, “The only kind of attack possible is a running attack which automatically carries the duelist closer to his opponent, or a thrown dagger.” Position B seems to be the default position and offers the most maneuvers. After purchasing six (or five or four) maneuvers for a given turn, any remaining segment points are 'reserve points'. Duelists who only needed to acquire four or five maneuvers in advance can use reserve points to purchase their additional maneuvers. One reserve point can be used to advance or retreat by one position. One reserve point can be used to alter a maneuver's target area to an “adjacent” area. (The illustration above shows 'transition areas' that can be used in changing target areas. For instance, changing from left arm to left leg costs two points.) Lastly, reserve points can be used to 'delay' a response maneuver so that it can be used against attacks from positions C and D.
In a swashbuckling campaign, any duelist who uses either a foul trick or secret attack a total of three times (each) loses the ability to use that special attack. In the one case, the duelist gets the reputation as a knave or a blackguard and everyone is thereafter on guard against foul tricks. In the other case, the secret attack is no longer secret and is, hence, useless. With the introduction of 'hit locations' to Lords of Creation combat, different effects manifest with different target areas. Luck rolls can ameliorate these effects. For instance, hits to the chest cause double damage; with a successful Luck roll, damage is not doubled. Damage to an arm is halved; unless a Luck roll is successful, an attack to a weapon arm causes the weapon to be dropped. I tried to keep the dueling rules from becoming cumbersome. Emphasis was placed on rapier combat. The Game Master can alter the dueling rules for other circumstances if he wants. He could interpose dueling with regular combat. Thus, opposing musketeers might fire their muskets at duelists; or a pirate might fire a brace of pistols before a duel began. The GM might add other weapons to the duel. Pikes (long spears) and a variety of pole arms were common in the Swashbuckling Era. A Pike would mainly be a thrusting weapon while a pole arm could both thrust and slash. The Swashbuckling Era also saw strange variations of “weapons” such as rapier and cloak, rapier and bar stool, or rapier and lantern. If the GM wanted to duplicate ship boarding actions, he could throw in the use of crude black powder grenades or even cannon fire. Terra now rules more than a thousand planets throughout the galaxy. All of the planets have been Terraformed to approximate the living conditions on the mother world (even so, some of the planets are only marginally inhabitable). Because of Faster-Than-Light drive (abbreviated FTL) the planets can be reached in days instead of centuries. Even so, Terra is only able to control such a population because of Luna-X. The Imperial Inspectors are another secret organization. No one knows how they are recruited, paid, or who ultimately controls them. But when they appear, they are quickly recognized. Imperial Inspectors have the right of 'high and total justice' even over The Lunar Corps or The Fleet. Strangely enough, the emphasis really is on justice. The Imperial Inspectors have a deserved reputation for total honesty, incorruptability [sic], and impartiality. Their justice is always tempered with mercy. It is likely that without the ideal of the Imperial Inspectors, the Empire would have dissolved into rebellion and anarchy despite the efforts of The Lunar Corps and The Fleet. The Imperial Inspectors provide an element of hope, a safety valve that emphasizes slow, peaceful change over bloody rebellion. Unfortunately, the Imperial Inspectors are few, and the evils they combat are many. Imperial Terra is only one of the Lands of Wonder, but nothing prevents it from being used as the basis of a space opera campaign outside of the Lords of Creation paradigm. 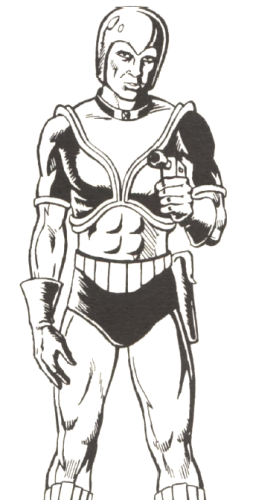 For Imperial Terra, Tom Moldvay incorporated concepts from various instances of science fiction literature, yet there was likely more to the setting than was published. The details he provided for the Starnomads suggest as much. Despite the recycling of a couple of names, Revolt on Antares could easily be part of the Imperial Terra universe. 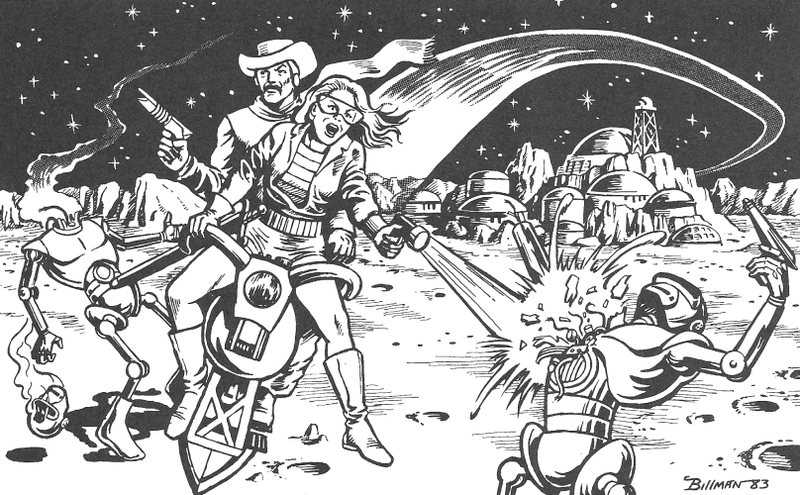 Other indicators of a more expansive setting can be seen in a two-part article in Avalon Hill's Heroes magazine (issues 2 & 3). This article allows for the creation of non-human player characters in the Imperial Terra setting. 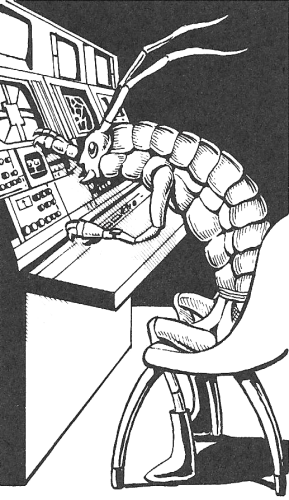 The article also mentions an adventure module in development, “Voria,” in which such characters could be used. ASTREGANS: In The Book of Foes, the 'n' is left out and this race is referred to as Astregas. They “are a race of intelligent crustaceans.” For MUSCLE, SPEED, and STAMINA, the roll is 4d6-1; for MENTAL and LUCK, 2d10. “Their minimum basic ability score is 6” and they have natural armor of -2. However, they begin with one less skill. 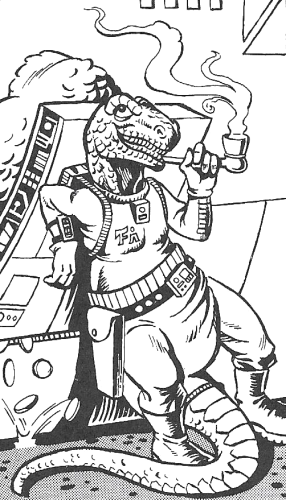 DRACONIDS: They are 8 foot tall, bipedal saurians with prehensile tails. They are vegetarians and have an easy-going attitude. For MUSCLE, SPEED, and STAMINA, the roll is 4d6+1; for MENTAL, 2d10; and LUCK, 3d10. “Their minimum basic ability score is 6” and they start with one less skill. FELINES: “Felines take pride in their extreme sophistication, but often revert to barbarism in times of crisis.” For MUSCLE, SPEED, and STAMINA, the roll is 3d6+1d10; for MENTAL and LUCK, 2d10. “Their minimum basic ability score is 6” and they start with one less skill. 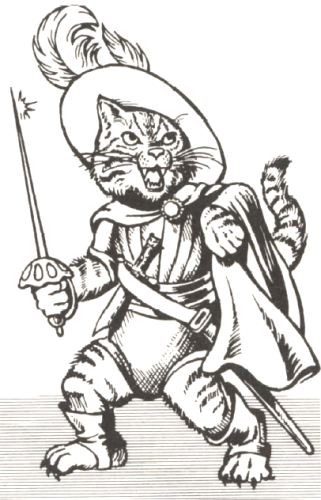 Using their claws, Felines cause an additional 1d6 damage in unarmed combat. 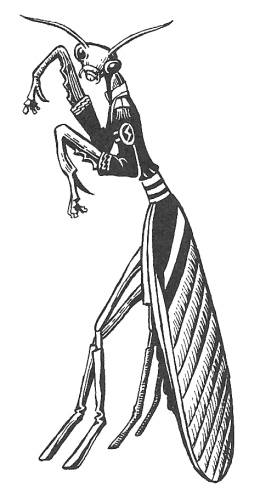 MANTIS LORDS: They “are 7 foot tall intelligent insects.” Mantis Lords “appear to be completely paranoid” and “seem to be psychologically incapable of trusting another race enough to sign a peace treaty.” For MUSCLE, SPEED, and STAMINA, the roll is 2d10+1d6; for MENTAL and LUCK, 2d10. “Their minimum basic ability score is 7.” They can use their vestigial wings to lift themselves off of the ground for periods of 1-6 rounds. 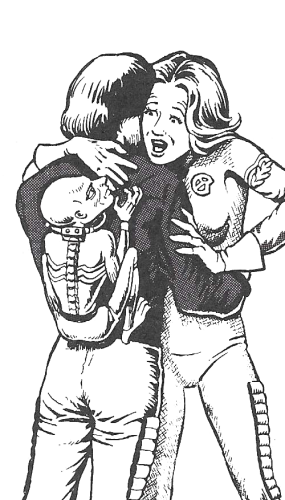 PONGOIDS: They “are a cross-breed between humans and the great apes.” They “were held as virtual slaves but won their freedom in the Great Rebellion” (which ended twenty years ago). For MUSCLE, SPEED, and STAMINA, the roll is 4d10-1; for MENTAL, 2d6; and LUCK, 2d10. “Their minimum basic ability score is 6” and they with two fewer skills. In addition to the intelligent, star-faring races above, the Heroes article also provides character creation information for the following. ANDROIDS: “It requires a detailed biological analysis to tell Android bodies from normal Human bodies.” Androids raised under clinical conditions “take pride in their aloofness and rationality.” However, “Androids created in the fetal stage and raised by Human families show normal Human emotions.” For all five basic abilities, the roll is 2d10+1. “Their minimum basic ability score is 7” and they begin with one less skill. They also have an armor value of -1. 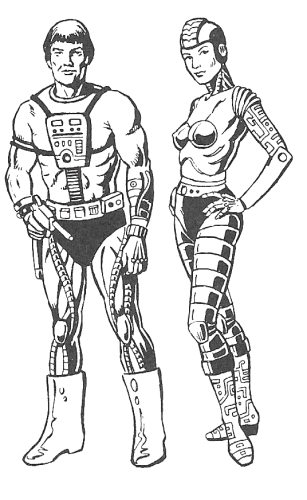 CYBORGS: “Some Cyborgs are virtually indistinguishable from a normal Human; others are virtually indistinguishable from a normal machine.” For MUSCLE, SPEED, and STAMINA, the roll is 4d6; for MENTAL and LUCK, 2d10. “Their minimum basic ability score is 6” and they begin the game with two fewer skills than starting Human characters. Cyborgs start with no money but automatically have the first Cyborg power (i.e., Recycling Implant). 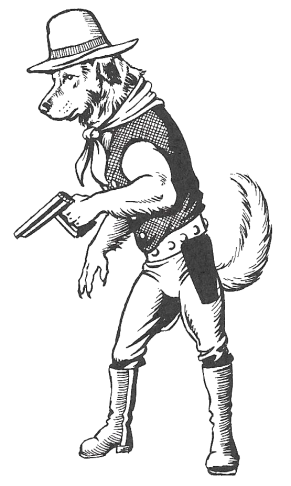 MUTANTS: They “are often disfigured in various ways and are usually less healthy than Humans.” For MUSCLE, SPEED, and STAMINA, the roll is 2d6+1; for MENTAL, 4d10; and LUCK, 2d10. “Their minimum basic ability score is 6” and they start with one less skill. However, each mutant begins play with the one power – the first power of either Poltergeist, Clairvoyant, Mentat, Telepath, or Magneto. ROBOTS: “Robot player-characters have not been playtested,” Moldvay informs us. “If introduced into a campaign, they will require a fair amount of work on the GM's part.” Still, Moldvay suggests a roll of 3d10 for each basic ability and an armor value of -3. 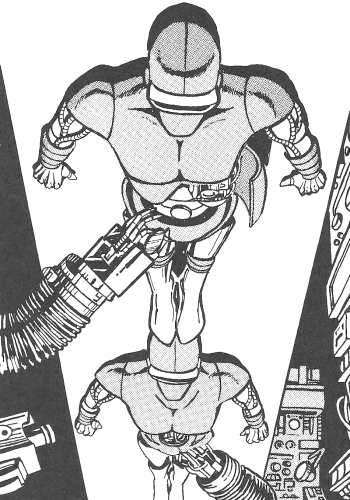 Player-character Robots would suffer from several liabilities. Any computer technician or engineer with the Robotic skill level could completely re-program Robots, making them difficult to play as player-characters. While Robots should be able to progress by gaining experience, such progress would have to be accompanied by actual physical changes (new memory circuits; larger, tougher body, etc.) Some of the skills and powers would be illogical for a Robot (a Robot acrobat?, a Robot necromancer? ).